To this ongoing cold. I tried to get an appointment with the doc but he's busy until "later in the week" and I could't be bothered thinking that far ahead. I had tickets to a Botticelli doco this morning, but decided to stay home. I'm not sick-sick, just feeling like if I behaved just one more day I can kick this thing. And it's been a week. We've had a beautifully crisp, frosty, sunny week, just the weather I love to go outside, and most weeds slip out from the moister soil. I've been weighing going outside for a few hours to disinfect myself, or to stay inside and tidy up loose ends, of which there are many. I predict I'll stay in another day because in the five minutes I checked the hellebores I planted a month (???) ago, I started coughing and today being a quiet day, it echoed throughout our little neighborhood. And it wasn't nice. In between all the yuck and blah, I've been knitting. I think I'll finish Mom's scarf today. Because I'm using three yarns directly off cones, I pull five to ten meters at a time and drop them on the carpet so they don't tangle. I saw one cone was nearly finished last night, and when I got enough unwound to finish that cone, these folks turned up. Everybody is lining up to be included in Mom's scarf; their chatter is bubbly and infectious. It'd be nice if the scarf could alleviate some moments of loneliness in her solo life. The crochet needle shows where I untended as the halfway point; I think I have just enough. On paper, I hadn't done much outside the "daily" abstract drawing, but Tess wanted to do another swap, and in the course of setting parameters, I started pondering a pet subject: textile as skin, clothes as symbols. It's a vast subject, because Tess goes really deep into research and consideration, while I reflect more as I work with the material, this is going to be a thrilling ride. In most areas of making, I see myself as a perpetual beginner with a clean slate. Yesterday I was pleasantly surprised to remember I had a few things I can look at if I want to reflect on the human body; the few drawings I kept from life drawing lessons of yore, the six frames from Go Figure, and a couple of Letter Journals I swapped with Tess; all LJs are also helpful reminding me of techniques. I love this meandering stage of making. I get severe FOMO as I start to focus, completely necessary and satisfying in a different way, but I am greedy. As regards weaving, I've lost a... vision??? for now. I know what projects I have on the looms, what come next, etc., but I've momentarily lapsed into the familiar Is-it-better-to-keep-weaving-or-count-the-losses-and-quit mode. It's not as depressing as it sounds; more like the mild exasperation one feels after watching a few videos of reckless people doing potentially dangerous stunts. Do you know the feeling? I may be just feeling sorry for myself. My May Sale is still on, and I've been observing the exchange rates. Kiwi $ has been super low against US$, JP¥ and A$, while it's always been worthless against € and £; C$ is the only currency we're nearly on par with. So I've had on my mind Kiwi customers, and once again introduced lower Kiwi prices. I do this sometimes; pricing is hard for me, and while I don't have to worry about undercutting galleries now, (there is just the one piece unlike any in the sale in the one outlet I have,) I also keep in mind what other customers, from galleries or from me, paid for similar pieces. We'll see how it goes. I read folks moaning about GDPR in a few places, particularly pertaining to small (craft) businesses outside EU. When I first heard about it, I admired EU's progressive outlook and envied citizens being protected thus, followed by being thoroughly annoyed by the gazillion websites asking for consent. Surely, you know I'm down here! Thus so far I've never sold anything up that way, so I started reading pointers more as a tourist. 1) I have a blog. I guess I need those annoying concent thing to pop up. How can I do this on Blogger? 2) I have a "business" FB page. Do I need to do something about that? 3) I don't do newsletters, e- or paper. 4) I only occasionally sell online, from my Blogger blog. a) I communicate via email but don't keep them after the customer receives the item. But I'm on gmail, so I'm sure they do. b) I DO KEEP EMAILS from NZ Post when I buy postage online, so this needs looking into, although so far nothing to EU. c) Paypal sales records are kept associated with my Paypal account over yonder; what do I do there? Again, so far no EU. d) Before Paypal, I issued invoices; I kept the electronic copies, email communications, and printed form for the last 7 years for tax purposes; my paper stuff needs to be locked, but again, so far no EU. e) I don't save addresses, e- or paper, after the customer receives the item. A good business is supposed to keep communicating with them, but I'm more afraid of hackers getting their info via me so I delete everything. f) I don't keep a customer database, e- or on paper. g) I don't use the cloud. h) My laptop is p/w protected and I don't use a smart phone, though a lot of good that does in this era. I run a regularly-updated virus scan, but again, not confident. i) I have a tiny backup hard drive. I suppose that needs locking away, too, but again, no EU thus far. If you know any solutions to these questions, or can think of anything else to worry about, do please help me. My sincerest commiserations to EU and bigger-timer friends. On Wednesday, I had the sniffles, so I went to The Met Opera's La Bohème on film armed with decongestant, tissues, water, nice smelling ointment, and throat candies. The first two acts went well, but Act 3, when Mimi starts coughing and begin her slow, musical descent to death, I started coughing, too. First I moved to an inconspicuous seat at the end of the row, but eventually I had to leave. I came home with two bottles of cough syrup and have been, ahem, overdosing on them. I'm furious I haven't been doing all the things I had planned for this week, that I'm under the weather, again. But also find it slightly funny; see, in high school, college and the first years at work, I went by the nickname of Mimi. And I haven't died yet. I've done 65cm and it's not going to be symmetrical. Today would have been a chilly but nice gardening day. Some birds around here are like me; they are chirpier on cooler days. Fantails are going crazy although on their best behavior they're still crazy. A wax-eye came though a narrow crack in the living room window, panicked, and pooed all over the window sill. I couldn't catch it in Ben's big, soft leather gardening gloves, so "cornered" it in a cardboard box, and slowly moved the box towards the window's opening. Don't come back; you pooed too close to the cashmere stack. I enjoy knitting in the evenings so much I've been going to bed an hour later every night but don't feel tired in the morning. If I wake up during the night, I can go back to sleep. I'm following what Oliver Sacks recommended: if I wake up, start doing something, (he meant reading,) I stop the moment I feel drowsy, because he wrote we have a 2-3 second window after which, (as in by the time I finish the sentence,) it's gone. I happen to think my tubular scarves are pretty wonderful, if I may say so myself, and I know Mom is going to love it in spite of her protestations. I don't want to stop after Mom's, (even though by 60cm, I'm going to be sick of this particular one,) although these are too warm for Nelson. And my family is completely sick of Mom and me forcing scarves upon them. Then I thought, I have many friends in Minnesota! A mate in Maine who posts a bunch of shivery pictures! Surely there are a few more. And it doesn't get cold over yonder for another, oh, four months? Evil smile! Targets!! I'm scheming. I fidgeted all morning, not tired, just restless, after having finished the work on May Sale. Funny how I had tons of great ideas of what to do next while working on it. It felt like a mini mental whiplash. While there are tons of little things that need doing/finishing ASAP, I kept refreshing my Facebook page and checking Emails every 15 seconds. Silly, I know. I was really looking forward to some culling and cleaning. I kept eyeing the knitting right next to me, but it was cold and I knew downstairs would be easier to heap up. So I wove. Usual selvedge-to-selvedge weaving is a good workout, I don't need heating but clasped wefts are different. 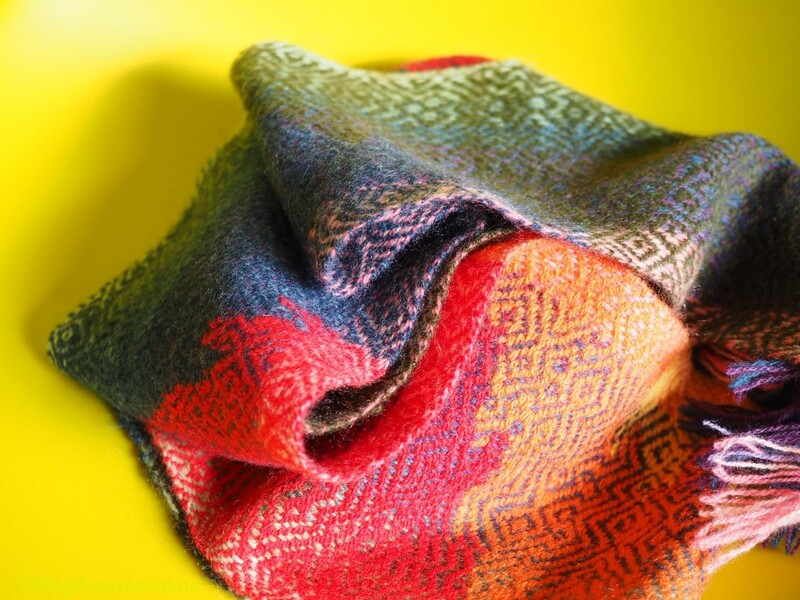 Clasped weft is time-consuming, especially with three colors at once. For a while I thought I got a hang of it, knowing how to pay attention to the two boarders simultaneously; then I forgot where I was with the treadling. And this one is a no brainer: 4-3-2-1-4-3-2-1-2-3-4-1-2-3.) The technique requires my complete attention. I was about to quit a few times, but I grew interested in the way lines/shapes grew, and I kept going. After two, (three?) hours, I got about 20cm woven and I was quite done. But here's my next problem. You know I'm not "small", but I'm very short. So with the piece advanced and the start of it over the breast beam, my middle keeps rubbing against it, sometimes distorting the shapes. And this is going to continue because I have my face just above the cloth when I do clasp the wefts. "Solvitur ambulando," a phrase I learned today, but hardly a new concept. Is this why we go on, or how we go on??? I knitted Mom's scarf a little last night and today. I want this piece to be 120-130cm so I'll keep going until I reach 60cm-ish, (currently around 23cm,) and then reverse my... scheme. I'm designing as I go and taking notes. It's been properly cold and windy and I love this time of the year. I made spinach soup and feijoa jam-thingie; I don't use much sugar at all, but let the fruit mixture cool and chuck in chia seeds. For dinner tonight, we had a choice of meat-eater, (Ben's beef casserole,) or vegetarian soups; we won't have to cook lunch or dinner for a day or two. Oh, and I'm sure you are as sick of hearing me as I am of talking about it, so here's a not-so cryptic message. I have 19 pieces for this sale. With the checklist updated, I know what needs doing for each item; some needs tags, photos, write-ups; others, only editing, maybe new photos. Plus (re-)pricing, making up more calico bags, (not for every single piece, but a few of smaller, a couple of mediums,) and twisting thrums to hang tags. And checking and rechecking what I wrote. I forecast a minimum of two days at the speed of the bullet train. One great thing about forgetting so much is I can't remember why exactly I had another crisis of confidence last week. I know it was about technique, that I'm certain my best technique days are behind me. It's about looking at my work objectively, assessing desirability of individual pieces, what else folks could buy for similar prices, like going to a memorable concert or taking home a beautiful cookbook. This last crisis started while inspecting my pieces, made worse by looking at photos of an impeccable Japanese textile exhibition. Yikes, every piece was parallel and perpendicular, it's a good thing I can't find the pics any more. But I don't remember much else, so I can't rehash those bad feelings, (which I am/was prone to do,) I can't relive the foreboding. Or is it re-boding? Never mind, I'm feeling so enthusiastic about weaving at the moment. With online selling, my biggest fear is misrepresenting the pieces. Conveying flaws, characteristics important to me, (i.e. "not as soft as my merino/cashmere",) and accurate colors, (at least on my monitor,) are priorities, although they can leave an impression of whopping negativity to some. In person, I am afforded a chance to observe prospective customers, and choose what/when to convey these things. I don't mean not telling, but they, too, notice things on their own. And then how shall I convey texture, the loveliness of such subjective experiences? I also like stories attached to pieces, and I have one for most pieces, but when I have 19 I don't want to overdo them. I also love moody pics and close ups, but how do they convey accuracy? This was one of the "identifying flaws" pic that didn't work. I used to be embarrassed by, (on behalf of?) a weaver who kept putting in the same pieces in exhibitions. I don't worry too much about my pieces living in galleries awhile, but what are we to do with leftover making in the long run? Even if they are nice and I as the maker think they deserve a loving human, it's embarrassing to keep putting them online. Do I need contingency plans beside mom, friends, and local charity shops? Goodness, this making thing, it's endless! Back in Feb/March, I thought it might be nice to have a big April Sale to start my new decade, along with nearly half a dozen other causes for celebration/commemoration I don't remember any more. It's not as though I haven't done anything in the meantime, but I find it difficult to talk up my work in general, especially faced with booboos in many of the pieces, these being not just "maker's remorse", but obvious to Pat as well. So maybe a May Sale. I've donated some to local charity, and I'm wondering how many here best follow them. But I'm serious today; I fired up the big monitor Ben bought me some years ago specifically to edit photos for my online shop, and to show further commitment, I made a warm drink in my trusty dog mug I bought in Dinkytown just before starting college in 1977. Except the first task is to decide in what order I am going to present the pieces, and then to fill in my paper checklist to determine what job needs doing re. each piece. So the pic is only for show, as it turned out; I hadn't thought it through! Funny thing is, this week as my carrots, I have further culling of yarns and art supplies, followed by further reorganizing of upstairs stash room, and sorting out the red Syrie warp so Pat can help me wind it on the warp beam next week. Whereas at once I might have seen these as my sticks. A couple of more things from Monday. Pat also moved a few bits to get to the back of the book piles in the stash room, exposing my finger-painted figures on postcards. And goodness, I love them. They are not bad, either, for stuff I whipped up in days/weeks. Another friend recently moved out of the house he was born in, and had my drawings framed and hung in his new place. In custom-made simple frames, (exactly the kind I used in our class exhibition,) they look goooooooood. I miss my life drawing classes. It was, for me, such a great escape from the weaving grids; such leaping and bounding outside the norm in a completely risk-free way. Ronette is/was such a good teacher, but the classes became too expensive for me, as a regular, quarterly expenditure. Rain, rain, rain... We used to have more intermittent rain in the winter, as in every few days. These days, it's dry spells followed by soaking spells. And frequent floods in flood-prone areas. We were thinking of Shikoku, (her dad's from Ehime,) or Kyushu, (her mom's from Miyazaki,) where it would most definitely be warmer than Yokohama in early November. Yesterday, she says, "Early November - we can catch the leaves changing colors if we go up north. Let's go north, you haven't been north." "But it's November; they might have snow the way weather is behaving this century." "Oh, I hate snow. I would never go anywhere with snow. But let's go North to see the leaves." So I secretly look up when leaves in Kyoto change - they're famous for their maples - it's south of Yokohama, though probably colder. But it's Kyoto and the aforementioned cousin and her husband know a lot about it. But I cringe at the thought of bringing up the the subject. "Kyoto? Are you kidding me? TOO MANY HUMANS!" So I shall go look up "leaves changing colors in November" in the hopes of finding somewhere south. My siblings would say it serves me right for having been the difficult child. I say I'm an extraordinarily good daughter. I abandoned the stretchy cotton cowl project for now, and started the other idea I had while making Ben's scarf: I'm knitting Mom a short tubular scarf; she won't have to fold it in a certain way to achieve maximum warmth and it'll be short and tiny so she can put another decorative scarf on top and then put on a jacket/coat if she likes. The width is similar to a sleeve. And because it's tubular, i.e. less purling, it's going quicker. The problem is, though, and I see this not as a problematic problem but one that requires thought/direction, is I find this more boring than Ben's. I'm using three strands rather than four I did with Ben's because it needed to be fluffier and lighter for Mom. Ben's had two strands of 100% in one color, one strand of a second color in 100%, and a fourth in the second color in silk/cashmere, which gave a comparative solid color plus light bits and sparkly bits. 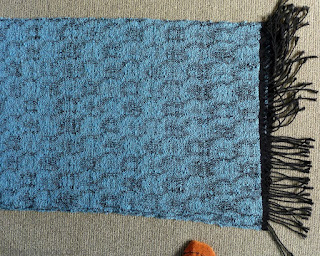 In comparison, Mom's has one strand of the first and the two others, so the overall color is lighter, but the cloth looks more mottled; funny that's the first word that came to mind while I used to see it more complex and interesting. I don't know if my taste is changing, if I want to make/include bold into my visual vocabulary; I don't know if bold necessarily means flat, or if something can bold and complex/layered. I hope it can, i.e. a scarf can look bold from a distance, but delicate/complex/layered close up? See how many adjectives I can come up in defense of not-flat?? This is what I started on Esther's warp. The warp is far less complex than the previous clasped weft warp, only a gradation of five achromatics. I've put my cousin's husband's piece on the back burner because I haven't come up with (a) good weft color/s. I wanted to use only black and white in the weft but don't have enough white, so I'm using a mid-gray as well. This white isn't even white but a very pale gray, and I wanted to use another pale gray, (second stripe from the right,) as the middle weft, but had none in 20/2. So the one in use is the same as the middle stripe, which makes logical sense. It's FAR more time-consuming clasping at two places per pick, not just twice as. I want the lines to be more or less parallel, but that's not as easy as I thought. With three colors, the middle color determines the size and the shape of the two stripes on the sides, so every pick I should weave the mid-gray first, but I find that unnatural and want to start from the side. What's weirder is the lines are so different from each other. I don't know why they're turning out this way, except that it's raining and the light in the basement is different, not necessarily darker, but with the new position for the loom, unfamiliar. I also envisioned the mid-gray being much skinnier, sandwiched between black and white, but that's not working, yet, either. Some weeks ago I took gazillion pics of leaves from one tree. I had clasped-weft composition in mind, but also, you know what they say about mixing red and green in textiles? The more they say "don't", the more I see possibilities. Hee hee. Also rare for me to look to nature for inspiration, but then I had an hour to kill before Ben was ready to go home, and saw the tree in the parking lot. Which reminds me of something I read a few nights ago: "If I had been a real writer I might have found post-modern beauty or at least a few lines that pretended I did. But I was an islander from an island at the world's end where the measures of all things that mattered was not man-made, and such sights that moved modern literature did not move me." Richard, Flanagan, "First Person"
I look to stories, fiction or non-fiction, history, art, architecture and literature/lyrics for inspiration. I grew up near Tokyo, and then spent a few years in Minneapolis pre-Internet. 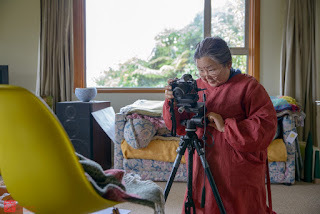 After 23.5 years in NZ and most of it in little ol' Nelson, and in the era of ever plentiful Internet, I find myself split in two: a keen awareness of not knowing what's going on elsewhere, or not being able to see it/them in person, of my own FOMO, (that's "fear of missing out", Mom,) on the one hand; and the relief from and appreciation for living far, far away from the trends/fashion/news/noise. That's something I've had to learn how to do, but I prefer living in the basement inside my head. 3) Clarify experimentation and non-product material from nice-garment material. And for goodness sales, Do not waste time weaving "not me" pieces I’ll then have to make excuses for in making them sound attractive. Nice. OK. I spent last night rewriting my new rules into actionable culling checklist, and I'm ready for another go. There is always FOMO about yarns that survived years of culling, but I do have oh, so much nice thin merinos, cottons and silks that I want to weave with! But then what if I want to change directions completely and work with fat yarns for bold expressions? And we haven't even touched the subject of books. The last few days I dithered avoiding what was supposed to be the big April online sale. Today, discussing our credit card bills and such with Ben, I finally decided to get off my unsmall. Still moving like the sloth that I am, because it's been so dark today, I decided to do some photographing. On these occasions, showing my pieces as attractively as I can manage has always taken a back seat to trying to represent the colors, (at least on my screen,) as accurately as possible. Plus, today, I found all kinds of fun filter settings on Ben's camera, which enhanced the moods of some of the pieces. I also wanted to show you Esther's piece; in the light pic the weft was flat, but in the dark pic the silk just glittered. Well, you'll just have to take my word for it. Probably the fav of the day. Ben's cable-knit scarf was finished Wednesday night. I let it relax a bit and washed it today, according to the cashmere source's instructions, much the way you would wash/press a knit garment. Even though I ignore her instructions on how to wash woven pieces and do my regular wool process: hot-cold-hot-cold, spin, then hottest steam press with press cloth, the end results look similar. The sides of the scarf curl back; while I was knitting it it was an almost-tube. Had I known this, I would have made it a tube to begin with because it is faster for me. I'm OK with knitting, but not so with purling (? ); I'm super slow and constant redoing the purl part. But if feels great and Ben loves it, tubey or not tu-be. I also finished weaving Esther's yesterday and just washed it. It's a solid, meaty piece, but I haven't been able to make as great fringes as I used to. 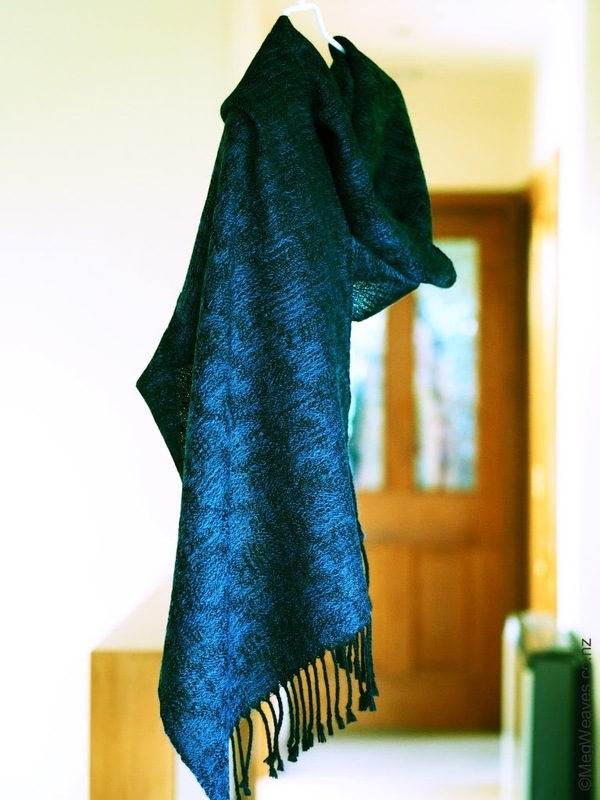 Come to think of it, I get good fringes with merino and cotton, but I've often had to rework cashmere fringes. I can't imagine twisting it any more as I squeeze maximum number of twists in all my fringes, but this needs investigating. I wonder if something has changed in the way the cashmere yarns are spun. I thought I'd weave a scarf for my cousin's husband from the same warp because he treats me to the yummiest eateries around Tokyo every time I go home but having looked at his many photos on Facebook, I haven't figured out his favorite colors. There is one powder blue I like and he has one sweater that includes something close to it, but on its own I don't have enough. I might weave something else first, like the black and white clasped weft, while I sit on the decision. 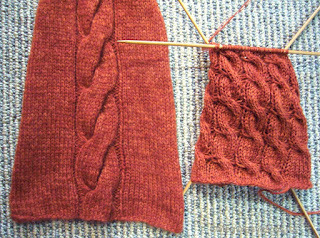 I started a new knitting project last night, too; loose cowls for me and possibly Mom using Brazilian stretchy cotton, but if you think I (don't) keep horrible weaving records, I work out my knitting as I knit, and I wanted to modify something I did before but I couldn't remember, and then I thought I am misremembering. Oh dear. But the bigger problem is this cotton is SO dusty and I can't stop sneezing and scratching, so I might change my mind and do a short, tube cashmere scarf for Mom. I am so OCD, in the garden I must have a plan for a discernible patch to start weeding. On Tuesday I dithered for so long I exasperated myself, and finally parked myself in the middle of the hellebores and weeded. It's my favorite spot, of course, and it's looked dire but usually to get there I start from the right, at the bottom of the steps and take half a day before I reach the hellebores, or occasionally from the right, which includes the oh-so neglected alstroemeria patch I'll need three (?) days to reach the hellebores without touching the ivy along the retaining wall. Thinking outside the mental cage worked; it was a good two and a half hours. I should have gone out again yesterday but it took me all morning to make seafood chowder and I was desperate to finish Esther's piece. Today it's raining. We booked our tickets to go to Japan in Oct/Nov. Ben's going for three weeks; I'll stay for two weeks longer, and while Ben's there we'll stay in a hotel. It's going to be fun as it's Ben's first trip back since Dad died in 2013, but the costs are making my eyes water. I best get my online sale going to help me. Esther's Santas were finished on Sunday; they have turned into Unseen University faculty. See Rincewind?? Their wizard weirdness and arguments are deafening; good thing they will live outside. Ben hates gnomes; I'm surprised he's looking forward to these guys being dotted around the place. I'm trying out a new orientation for the four-shaft in consideration for where the tapestry loom might go. This orientation gets better lighting for weaving, but it seems to take up a whole lot more space, and I don't like it because I can't get a straight line for winding on the warp. The loom can be tilted slightly to this end, except it's so delicate I spent much time adjusting the angle while putting on Esther's warp. Esther asked for an traditional look. After sampling, a number of achromatic weft choices looked flat, so I'm using 20/2 100% in mid gray, (same as the center warp,) and a slightly lighter gray in silk/cashmere, together. It doesn't look exciting now, but after washing silk will shine, so it will look a little more complex/interesting. That's the plan. And 83cm woven. Ben's knit scarf is now 136cm. Or 132cm. 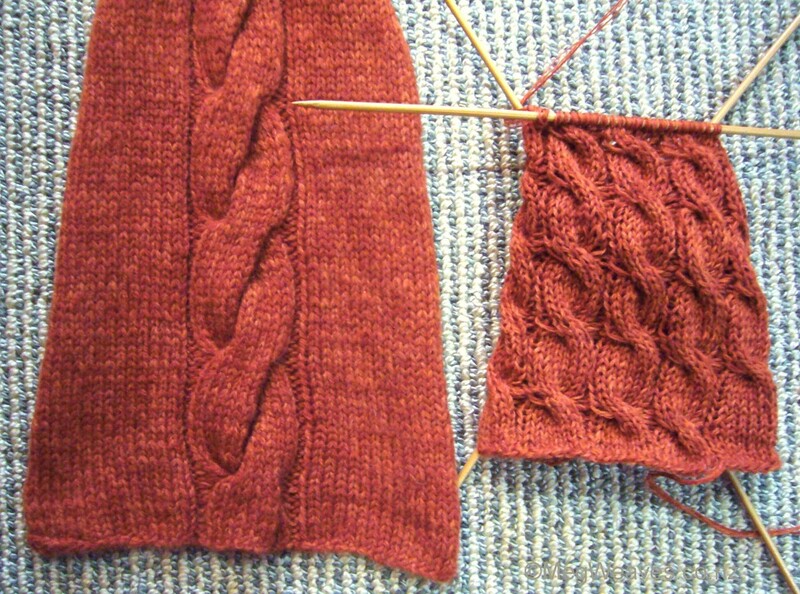 Knitting stretches so much I'm having having difficulties getting an accurate read, but it will be done this week. Hello, again. It's been a week. Ben's cable-knit scarf has reached a meter, 103cm to be exact. Best evenings I managed 7cm-ish, so I'll be happy if I'm done this week because I have three/four smaller knitting projects in mind already. Here are the two from black merino/mohair warp in the same hellebore draft. The piece on the left has scalloped selvedge on both sides in places, but not enough to "disqualify", and has a super duper pleasing hand. The silk piece on the right has uneven beating and in this draft, it's like very obvious. But the big-dog-leaning silk weight is luxurious. Not sure how to deal with this. The sent-to-me-by-mistake weft is a warp yarn, probably merino. I didn't believe my eyes nor all the reading because even back then it was impossible to source them that I knew of. (Which is probably why this was not on their website; I'm thinking a secret/special order?) It doesn't full, but sits/floats on top of the cloth. In this context, with the piece looking like a whole bunch of similar faces, I like the uncommitted/uncertain appearance. This weft is skinny and compared to what I normally use, wiry, almost like thicker mercerized cotton. Yet with the merino/mohair warp, fulled, the resultant cloth doesn't feel like a mixture of two distinct materials, not like wire and fluff I've also woven in the past. The piece has a hard-to-describe texture; it's super drapey, not cushy/clingy; has a sophisticated grown-up feel, definitely a special outing piece and not for "sick day in bed" comfort, (I tell this to all my cashmere customers, and some wear them as prescribed!) and it has been a most surprising outcome. Now for the fun part; the first clasped weft warp, almost a year in the making. The picture shows what I was seeing as I wove, i.e. starting from the near side finishing at the far side. 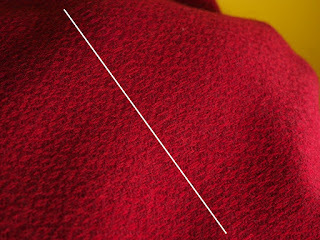 A was the fist and the only piece from the first threading, after simplifying the treadling. I had no other plan than to not change the colors too often and not to use three at once, so each color section is long. The sizes of the sections and color combination is most pleasing to me. Even that the palest lime patch is not exactly in the middle lengthwise is a nice touch. You can see I started B out more ambitious. but got a little tired and the sections grew longer. As I wove I wasn't sure about the twill design; I thought a regular pattern/draft showed the irregular color changes better. And the lime green looks out of place. C and D, I chose the weft colors first; in fact, while weaving B, I thought the saturated crayon colors very attractive and wound and lined up the bobbins for C, but as a whole piece, I'm not sure. I know it'd look good on black/charcoal/navy. I also started to think changing the direction of the twill so often wasn't making the piece necessarily more interesting. I tried to recreate the balance I liked in A. Then came D. I'm sure I've seen a few like this in the past, though possibly done by dyeing. I chose the dark yellow first, and wanted another color that didn't compete and chose the lime, though now I'm not sure about the selection. I prefer the loud, impactful combination like A, at least similar intensity in the two colors. I also simplified the treadling a whole lot more. The blue/purple part of the warp has three colors, which came through beautifully while weaving, especially with the lime weft part, but after fulling, that's looking ho hum; it looks much better with the navy weft in B and C.
Next warp is Esther's in black/white gradation. After I weave hers, I'm thinking of weaving another in the style of D with black and white wefts, a night time city skyline. At the moment I'm more interested in the color interactions in the clasped weft pieces than the shapes. I've been looking at the brown piece, and I like the draft better ever day. 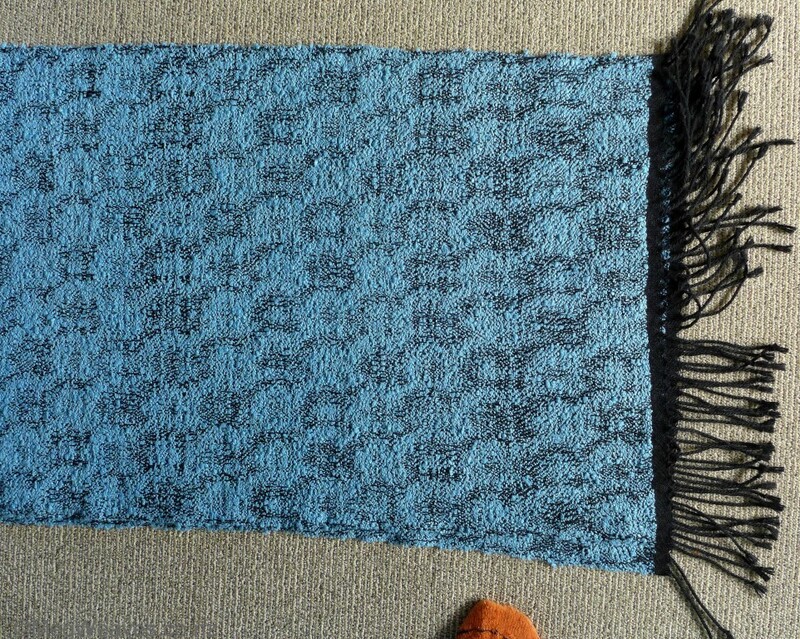 I am contemplating using the gray warp to weave better-planned pieces, (i.e. threaded symmetrically,) but I'm not sure. The original squares idea is just as appealing. I've had the biggest carbohydrate blowout in the last year and a half, a week of munching on crackers, chocolate, ice cream and frozen berries; I even ate a bowl of cereal! Though we've never been completely off carbohydrate, I've never blown so completely and consciously so far. I've been despondent and disgruntled by our meals for a while, (so boring!!) without trying; if you do carbo-free seriously, meals aren't as boring as you'd expect, and the body becomes so sensitive to all kinds of flavors and smells, every meal is sensational. That hadn't be the case for a while chez B&M; I still make sauerkrauts and other bottled stuff; we still have protein sitting on top of a big salad, but when Ben's not home, I'll even fetch a step ladder to dig into our "special/sometime" treats.